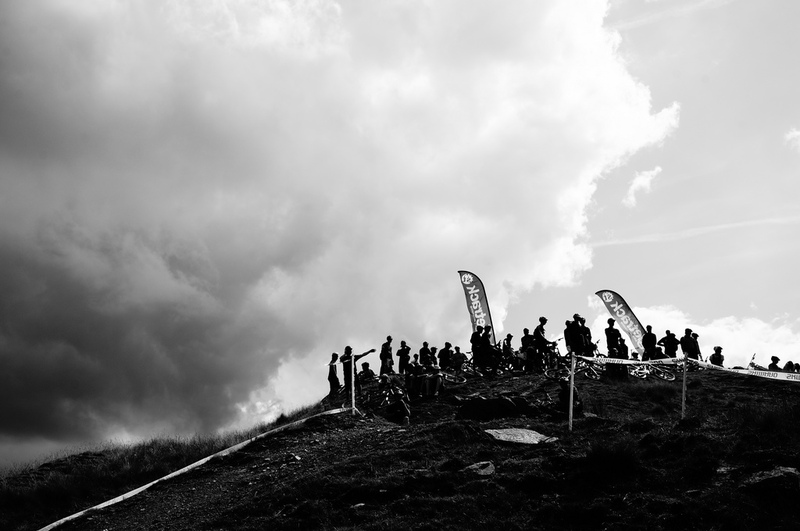 I know I go on a bit about the Three Peaks Cyclocross. It’s nice for me at this time of September to put down a marker as to how I’m feeling. It’s my event and I am going to enjoy myself on Sunday. There are a million things that could go wrong and doubtless scores of things that will go wrong, but I’m a bit above all that now. I’ve ridden every race since 1995 and learnt that bit more each year. There have been some big lows (including an abandonment with a snapped seat post very early in the 1999 race, and a delayed finish because of a broken collarbone last year) – but I’m above all that. I know things can go wrong and when it all comes together it’s great. There has been oodles of dedicated training, some fun film making when that all got too hard, and the now customary month on the wagon (recommended!). 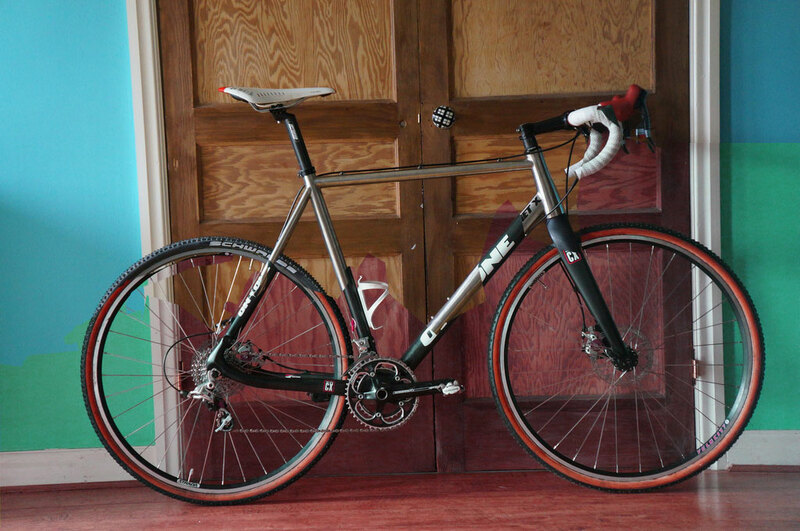 The bikes are the finest I have ever prepared for the race – ‘cousins’ of traditional cyclocross bikes to the connoisseur – pretty dedicated 3 Peaks bikes in almost every respect. There’s the usual minor wobbles in preparation too – the things that make it that bit more on the edge – it wouldn’t be the same without those. This year it’s been a cold. The type of thing that wouldn’t normally bother you too much but hit me bad in a race on Sunday. That’s made it hard to finesse any training (something I personally think is under-rated. A lot can be done to form in a final few days). There’s also the weather but that’s affecting everyone. It’s exciting. There will be some adventures had on those hills. Looking at how I manage to train these days I know I’m not in for a mega result, but really hope a top 30 is on the cards. My “First Bike” and the one I intend to race throughout on. With SRAM Red, BB7, 42-27 rings, 11-26 cassette on Hope Pro 2 Evo with Mavic Reflex Rims, Schwalbe Racing Ralph HT Tubulars. Bar top levers fitted. 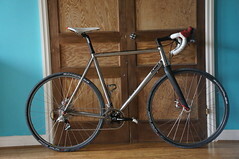 A spare bike I don’t intend to use unless there are any mechanicals or punctures on the other bike. 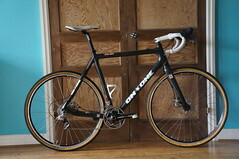 Equipped with SRAM Red / BB7 46-34 rings with 12-34, Hope Hubs with Velocity Major Tom Rims, Challenge Grifo tubulars. I officially proved to myself at the weekend that I’m jack of all trades and master of none at the Singletrack Weekender this Saturday and Sunday. One of those ‘special’ events in the annual cycling calendar for the last four years, I’ve only just managed to actually ride it. The weekend comprises of a ‘classic’ trials (5 sections, 2 optional) and a downhill on the Saturday, then a cross country race on Sunday based on how many time penalties you’ve earned yourself on the two Saturday events. 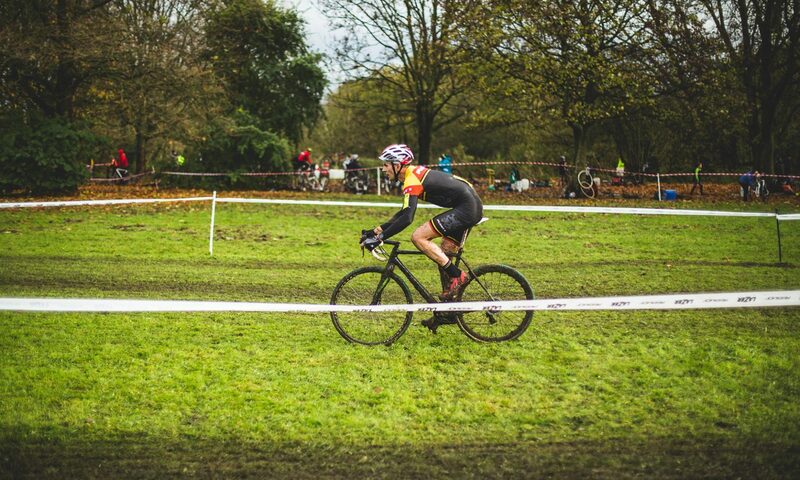 In my case, six minutes of penalties were too much for me to make any final impact on the short cross country race on Sunday, but we all had a heck of a laugh throughout the weekend and it comes highly recommended for anyone who rides a mountain bike. Big fun. 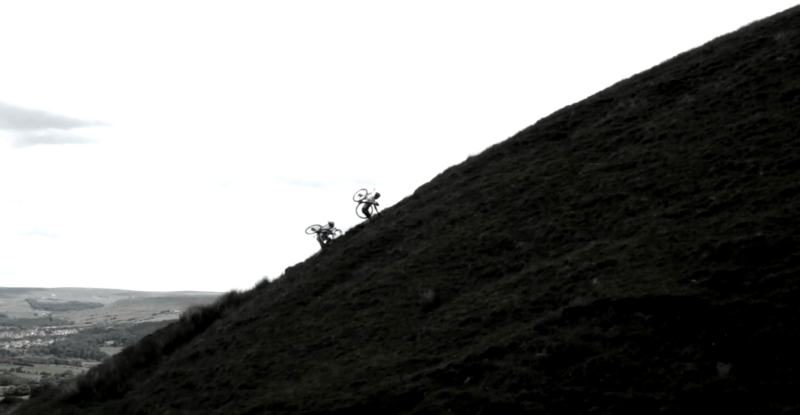 Shimano Singletrack Classic Weekends 2012 (Day 1) from Dave Haygarth on Vimeo. It’s one of those rides. One of those ‘have to do it every so often’ rides. One that you look forward to and dread in equal measure. 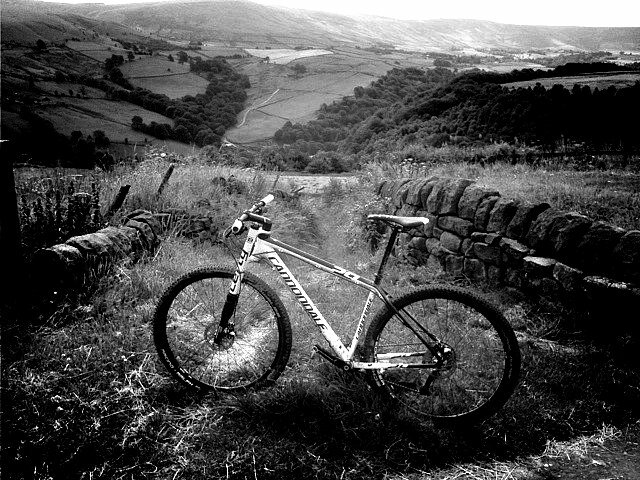 The Mary Towneley Loop is a 44 mile extension to the Pennine Bridleway and is a doorstep challenge for me, living 4.5 miles from the route itself. It’s too long to do in all but the brightest and longest summer evenings but it’s not quite a day long ride. It’s hard, but at times very rewarding, and you always seem to come out of it much fitter than when you start it. With c. 6,000 feet of climbing it’s bound to be. I love doing it, but I really hate it too. It’s a simple formula that’s bound to win every time. Putting gentlemen together in a mountain area for a couple of days is just about all it takes. Other holidays or excursions have various frills around the edges, but the basic raw ingredients of a good bunch of fellows and a load of stunning upland are what it takes to make the bread of Heaven. And so it was, last Saturday morning at c. 10am, I met up with Phil, Gareth, Adrian, John, Peter, Simon, Rob, Richard, Stephen, Sam and Jim for a walk in the Aran mounains, a strangely under-visited non-honey pot corner of Snowdonia. What followed for the rest of Saturday and Sunday was fairly predictable in places (the tone of the banter), hugely unpredictable in others (Gareth’s near-fatal near-head near-injury). Sitting down to eat well deserved and well-shaken lunches on top of hills was on the agenda; breathtaking cloud inversions and Broken Specters were possibly less easy to foresee. … but that is the nature. If we got together every year for a walking weekend (and we have done for ten years running now) and everything went too much to a formula, it’d be fine. The unpredictables; those surprise views, the sudden outpouring of hymns in Welsh Male Voice choir stylee, the bizarre, twisted concepts that can arise from meandering conversations – those bits are the spreads to the bread. Well that was lots of fun and very satisfying. I’ve ridden every three peaks cyclocross now since 1995 and apart from a broken seatpost in 1999 about 3 miles into the race, I’ve completed them all. I had a great day out yesterday doing the event that I go through in my head for 364 days of the year. In my sporting life, it’s the absolute pinnacle of the year. I essentially had a ‘clean run’ with no punctures, indeed no mechanicals whatsoever to talk of. A first, I think. The dry ground was a bit of a surprise. A recce ten days before had left me thinking it was going to be a soggy, hard day out. The speed at which everything dried out with no rain at all during those ten days was quite a shock. For the second time, I used a three-bike strategy that worked really well for me. Having some faster, more expensive and more fragile carbon wheels for the road sections gave me a lovely break from the utilitarian and a bit sluggish Maxxis Locust tyres that cope so well with the rocky parts of the course. Tolly and Simon were great with the changeovers and it’s so reassuring to know that if something did go wrong, there’s a bike and helper not too far away. In near perfect conditions 446 riders set out all together in an enormous, stretched out bunch from Helwith Bridge at 9:45 exactly. The unmistakable sound of Roger Ingham announcing the race was approaching sent a shiver down my spine – I’ve been here so many times before but I was very, very edgy, and was finding it hard to turn the pedals. When we’d done two of the 3.3 miles ‘escorted’ road section, my GPS told me that we’d averaged almost 25mph. The neutralised section was, thankfully, not very neutralised, as the speed helped to keep the riders strung into a longer, thinner bunch. 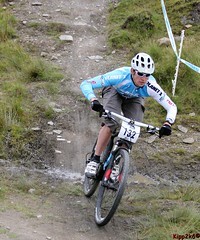 By the time we reached the ‘proper’ start at Gill Garth, I was struggling to stay in contact with the front of the race. I was feeling decidedly sick and not at all comfortable. In my heart of hearts, I knew that this was nerves, and just had to keep myself plugging away. 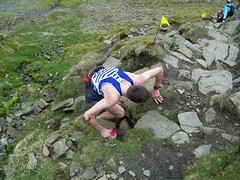 I was in around 60th place as we got onto the first open field and onto the fell. I was feeling slightly better but my pride was dented and I had to bide my time and just get over it. As the climb of Simon Fell got ever steeper, I managed to start picking my way slowly through people. I started to feel much more like my normal self as we re-mounted on the slow terrain on the ridge to the North of Ingleborough. I reached the summit checkpoint not knowing where on earth I was placed, but feeling like I had my work cut out to better my previous best position of 15th (in 2006). A later found that I was 30th over the top, (thanks to the excellent electronic event timing!). I consolidated on the descent taking a number of places from people who are clearly better at running up hills than riding down them (thank the lord for such people). By the first bike change at Cold Cotes, I was feeling pretty good, and linked up with Keith Murray (a good reliable workhorse) and someone who’d had to run quite a bit of the Ingleborough descent and was in no mood for working. Keith and I were spurred on to try and make contact with Stu Bowers, who we could see just ahead (and did just catch at the foot of Whernside). Simon made his first ever bike change for me(!) at Chapel le Dale and soon I was dismounted and alternating between running and walking up the steepening path of Whernside. By the summit, I was starting to get the first feeling of fatigue in my legs. I’d been going for 1 hr 45ish and had averaged 170bpm on the heart rate monitor, so it was okay to start feeling tired… I just had to keep fluids and minerals coming into my body and not over-exert myself. The track over the summit ridge was pretty much as it has been for a few years now. Fast and with good traction, it’s one of the areas of the course where a good climber will make up some ground. Not being a good climber, I managed to limit my losses and kept the cadence pretty high on the bike, and hit the summit 21 seconds ahead of me. I soon made this up on Keith who was going through a bit of a doddery moment on the top part of the descent (we all have them!). We headed down together catching once again those nimble little fell runners who descend like the light boys that they are. (I’m just jealous of their weight!). I took a dramatic trip over the bars and enjoyed an incredibly soft landing at one of the gnarlier parts of the descent, but when i looked back, it seemed that Keith had gone the same way – he was nowhere to be seen. I had to plough on to Ribblehead making the most of my fairly good speed on the flatter, faster dry mud track. As I dropped down to the viaduct and headed up to my bike change (thanks again, Simon and the lovely Katie), I made contact with two other riders for the valuable load-sharing on the fast road section to Horton in Ribblesdale. I pulled ahead of Phil Hinchliffe and Steven Macinnes inadvertently (I didn’t want to be on my own on the road!) so managed a quick banana and a good slurp on my Science in Sport ‘Go’ drink in the bottle, before being rejoined by them and we shared the work fairly well on the way into Horton, where Tolly was waiting for me with the bike for Penyghent. Another smooth change and I was on my way up the rocky scar road. It was nice to spot Andy Rushforth snapping away. I was unsure whether he’d be out and about as he had some visitors over, but it’s great that he found the time and got a great set of pics, as usual. The climb of Penyghent seemed pretty much as I expected. I kept a sensible cadence up making the most of my bottom gear of 34 x 27, and didn’t panic when I quickly lost contact with Steven Macinnes, who clearly was going to climb way better than me. I stayed with Phil Hinchliffe on the climb and kept alternating between a walk and a run up the evenly graded track. I surprised myself a couple of times with how fresh my legs felt when I ran, but fatigue was quick to catch up and I had to walk every so often. It was great to see Rob’s lead looking so utterly unassailable, and also a good morale boost to see that Lewis and Stu had both had seemingly good rides. Things had gone with form and it was reassuring in many ways to see Stuart ahead of me again after his dreadful ride in 2006. He’s a quality rider and as a team mate I genuinely share in their success. Talking of team mates, Damian Smith – relatively new to Team Wheelbase and an unknown quantity to me was closing in and only ten seconds or so behind me by the summit of Penyghent. I have appearances to keep up and needed to get down there pronto. On top of that, I was under the impression (misguided as it happened) that I might have been on for tenth spot if I got my backside down there quickly. I went off like a bull in a china shop down the fast top bit of the descent. A few hairy moments but I was seemingly getting away with things, but I suddenly hit the deck whilst trying to overtake Ian Taylor – a fellow seasoned three peaks campaigner. I took a daft line and lost my front wheel down a pothole. I was quickly back on and caught Ian again before we hit the scar track, where I later found out he punctured. I was in no mood to slow down now so near the finish. I took the track recklessly and paid the price when I took a high line way too fast and caught my front wheel on a rock. I went down hard and fast and my shoulder took a pounding. Adding insult to injury, I went into immediate cramp and had to nurse my hamstrings as I tried to retain my disturbed momentum. Not a good moment. I was a bit shaken and sore from the cramp now. The easiest bit of the descent followed, but my flow was well and truly broken and Phil Hinchliffe caught me near to the bottom. With cramp a clear and present danger, I made the decision not to change bikes in Horton for the last couple of miles. Despite my best efforts, it caught up with me as it did three years ago on the otherwise fast and easy run in to Helwith Bridge. I had to let go of the valuable wheel in front of me and swore very very loudly as I was unable to move my legs in any cohesive way. 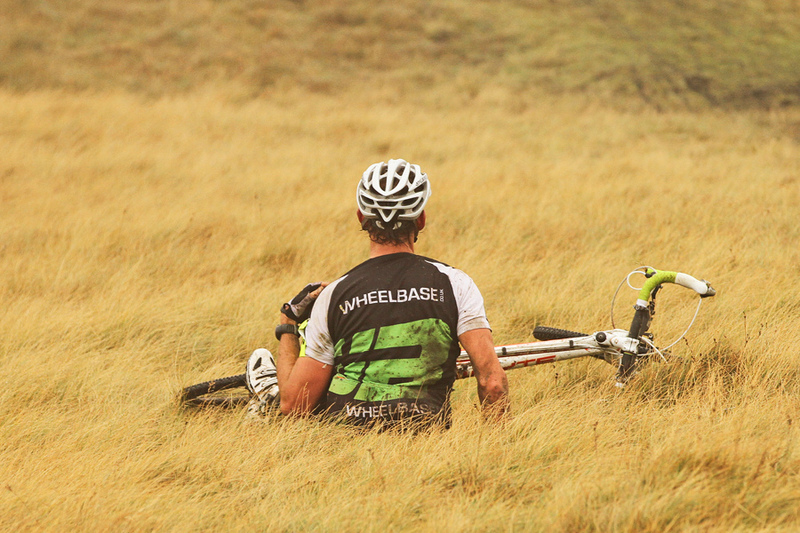 Watching someone just ride away from you after a hard day out is soul destroying. What made matters worse was that I could see Phil cramping up 100 metres ahead, but as I recovered, so did he. I was once again strong again to close the gap but it was too late, and I rolled in a couple of seconds down in what turned out to be 13th position. The time was good enough for a PB after eleven finishes in the event – shaving a fairly healthy 4 mins 59 seconds (irritating, huh? ), coming in in 3:22:24. A reconnaissance trip, and meeting my first pen pal. A great day yesterday indulging my hobby by going to do a recce of parts of the route for the Three Peaks cyclocross, which’ll take place a week on Sunday. Whilst I’ve ridden the course 11 times, it’s always worth a recce on certain parts of the course because the nature of the upland paths are such that they change dramatically each year through erosion. With much of the event being on private land, there are only certain parts of the course you can legally recce, and fewer of those you can legally cycle upon, but it’s worth putting in an afternoon of meticulous inspection. The lines we decided upon on the descent of Whernside two years ago are no longer appropriate, and the path has generally deteriorated at quite a surprising rate. At the extent of the Blea Moor bridleway Lewis, Stuart and I ‘hid’ our bikes in the spike rushes and continued up to the summit path of Whernside, and must have looked more than slightly off jogging along in our full cycling gear, Helmets and all. Nearly back at the car at Ribblehead, I fell heavily for apparently no reason at all. Straight over the bars and humiliated in the grass. On going back to inspect the grass I’d just ridden over, I found a very well disguised overgrown rut. A reminder to be wary, and a whopping thigh bruise in case I tried to forget. We popped down to Horton in Ribblesdale for a quick recce of the Scar Road which takes riders a third of the way up – and down – Penyghent. Again, it was a wothwhile trip in that it refreshed the memory and helped us to pick a sneaky line or two for both the climb and the descent. Okay, so we’re talking seconds of difference, but if you took a bad line and crashed or punctured as a result, those seconds are significantly more. The short excursion up this track also gave me the opportunity to finally meet one of my Flickr contacts. I discovered Andy Rushforth’s photos of the three peaks two years ago and we have since shared comments on each other’s photos regularly – this is the modern day equivalent of a pen friend – something I’ve never had. Knowing that Andy was a Horton resident, I asked him if he wanted to come out on his MTB to meet up with us and take a few snaps. I was really pleased when he said he could, and he didn’t disappoint – snapping away and having the opportunity to chat whilst Stuart fumbled fruitlessly with a split tubular on his bike. A great day out. My pics from the phone camera here. The Fred Whitton Challenge is billed as a 112 mile sportive ride for charity around the English Lake District, taking in six of the major passes en route… starts and finishes at Coniston, and includes the climbs of Kirkstone Pass, Honister Pass, Newlands Pass, Whinlatter Pass, Cold Fell, Irton Pike, and finishes with the brutal Hardknott and Wrynose Passes. I’ve ridden the Fred Whitton Challenge in the Lake District for the last three years now, and seem to have got by on not much specialist training, but today’s event was the closest I came to coming unstuck! Although I’m not too gifted as a climber and don’t immerse myself in the world of long training rides, I’ve managed to get by on some type of fitness or other in the past. This year’s preparation was taking it to extremes, with my longest ride this calendar year being 2 hrs 15 minutes (the ride is generally over 6 hours). I also had a three week chest infection which culminated in a course of Penicillin starting on Wednesday. We’re not talking ‘training camps’ here. But cometh the hour, cometh the Loafer, and I managed to somehow avoid death on the hottest extended bike ride I’ve ever done. Avid readers will remember that I cleverly decided to ride as a domestique last year (a team helper), hammering the pace hard for the first 50 miles, and cunningly giving myself an excuse to do the rest of the ride at a relative trundle. Well this year I had a helper – a super-domestique in the shape of last year’s record breaking rider Lewis Craven, who’d been equally slovenly in his training in recent months, and was quite happy to work like a horse with me on the front of the 50 strong group until the first ‘killer’ climb at 45 miles; Honister Pass. Whether the pace or the lack of training was the undoing of Lewis and I is up for debate, but come undone we did, big time, later on. On the descent of Newlands Pass, Lewis punctured, and we agreed that I should push on at a leisurely pace to the top of Whinlatter Pass, where I’d wait for him if he hadn’t caught me. And wait I did, for ten minutes, until one very dead looking record-holder emerged up the climb. Lewis had blown and we were half way round. Bugger. We took things really easy along the western side of the course, and decided at the second and final food stop (Gosforth) that it was time for a good rest and a gossip, so we ate and chatted to a few helpers and set off back ten minutes later. 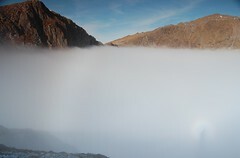 The approach to Hard Knott pass, easily the hardest part of the route, is purgatory. Especially when you haven’t done the training. But up we rode, where most decided to walk in the heat, and were starting to approach home and dry. It was 28°. The heat was a contributing factor in Lewis’s second puncture on the hairy descent of Hard Knott pass (the hot rims from braking melted the rim tape and a spoke poked into the tube!). I mended it for him this time. He was in a worse state than me. We pressed over the final climb of Wrynose pass and rolled home rather flaked out and a bit sunburnt in a pretty unremarkable time of over seven hours. Oh well. We still winged it I think, considering the lack of training. And we were mini heroes in helping keep the pace so high early on that Wheelbase team mate Rob Jebb manage (along with national hill climb champion James Dobbin) to break Lewis and Stuart Reid’s record for the event. Bitter-sweet stuff for Lewis, but that’s cycling. He was modest and full of humility throughout though – a very respectable man! Photos here (or slideshow if you’d prefer). My Stats from the Garmin 305 (didn’t pause it at any time). I had a cracking day out on Saturday with Elvis. Katie dropped us off at Ribblehead to watch the Three Peaks race which I wasn’t competing in again this year, and the build-up to the leaders of the 740 racers coming through led to an electric atmosphere. When the first few leaders had come through, we ran on to the Hill Inn, then followed the course up to the summit of Ingleborough (Google Earth track here). My main reason for being there was to give moral and fuel support to Rob Jebb who cycles with me in Team Wheelbase. Rob had won the race for the last three years, but this year’s ‘international’ status of the race (the World Long Distance Mountain Running Challenge for 2008) meant a larger field, more prize money, and more nervy runners! In the end, after a super-fast start to the 24 mile race, Rob finished fourth. I ran down to Ingleton after that, dropping my camera twice on the way, but I somehow got away with it. Elvis didn’t like standing about watching runners much, although he did take the opportunity to beg sarnies from spectators whenever the chance arose.